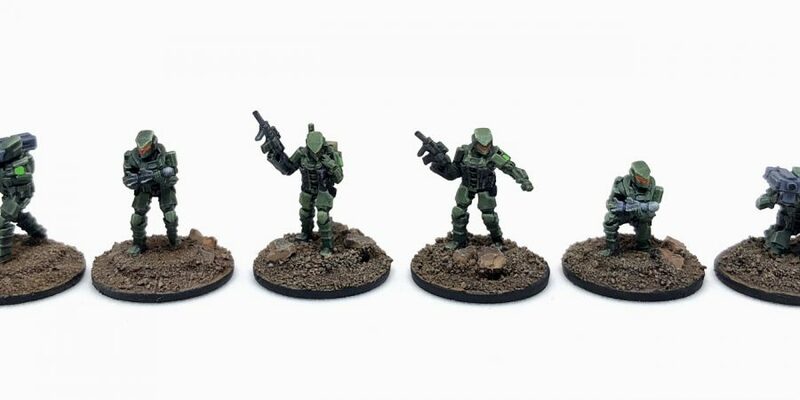 This is the third set of White Dragon Miniatures depicting Marine Tactical Unit troopers. Fire Team Charlie is a heavy weapons unit equipped with missile launchers called MIPAWs. MAIN INDIVIDUAL PORTABLE ASSAULT WEAPON: Another weapon which can be utilised by the Fireteams is the MIPAW. This is a large shoulder fired weapon able to launch an explosive missile up to a kilometre unguided, or can lock onto a friendly designated signal or ‘painted target’, further away. The MIPAW is designed to be lightweight and easily portable by a small team, allowing it to retain the flexibility of the host squad, as its low-recoil gives it the ability it to be fired on the move. The fire team consists of a commander, a trooper with a comms backpack (possibly a combat controller), two MIPAW-equipped troopers, and finally, two more troopers, each holding a missile ready to load. For this squad, I chose a darker color scheme closer to what I used for the Armadillo Support Mech, with a base of Vallejo Gunship Green. I’ve found that you really need to exaggerate the highlights and details on these 15mm models since they are so small when viewed at normal tabletop distances. Once again, White Dragon has done a fantastic job with incredible detail and great poses in this pack. I’d love to get my hands on the 28mm versions of the MTU troopers if they ever offer them for sale on the website. I wanted to pick up some of these, but appears a lot of stuff is out of stock. Did you by chance pick up the Jackal Light Combat Mech from them? Curious on that one, as I was looking to pick one up! I have not purchased a Jackal Combat Mech yet. It resembles a little Fiddler, but the pose didn’t seem as dynamic, so I decided to hold off until I get my Fiddler built and painted. I’ve been waiting for the Centurion MBTs to come back in stock, but it’s been at least six months since.